Tell Rhode Island and Boston: End the Deadly Exchange! We just won two unprecedented victories when Vermont and Northampton canceled participation in an ADL delegation for police to learn from the Israeli military. Rhode Island and Boston are still planning to send their high-ranking police – and we think we can get them to change their minds. We have ONE day – CALL NOW. I don’t think Rhode Island/Boston police should be training with any foreign military. Militarization is a crisis at our borders and in our police forces across the US, and training with an occupying army is the last thing we need. Israeli armed forces, including the military and police, have an incredibly well documented history of violence and grave human rights abuses, particularly in the areas of racial profiling, surveillance, mistreatment of prisoners, and suppression of social movements. They are not any kind of model for Rhode Island/Boston. Northampton and Vermont police canceled this week, there’s no reason you can’t make the same choice for our community today. 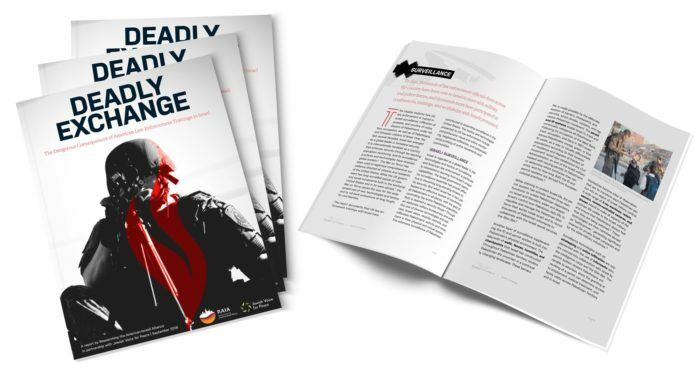 For background on this campaign, read this open letter from the Pittsburgh Coalition to End the Deadly Exchange for Mayor Walsh of Boston and Governor Raimondo of Rhode Island. We have learned with grave concern that you are planning to send top ranking officers from city and state police agencies on a training junket with the Israeli army. This training is one of many sponsored by the Anti-Defamation League each year bringing top cops alongside high ranking officials from Immigrations and Customs Enforcement (ICE), Customs and Border Patrol (CBP), and Federal Bureau of Investigations (FBI) to learn from and with the Israeli military and police. We think these trainings are deeply harmful and we urge you to ensure your law enforcement personnel do not go. Vermont and Northampton just canceled their participation in the program. We implore you to join them in making the right decision. We’re writing to you from Pittsburgh, even as we’re still reeling from the horror of white supremacist terror here. We believe we are at a crossroads, and that this trip represents the need to make a clear choice. There are two paths stretching out from the pain our community has experienced. On one side, Progressive Jews and our partners are rising up. Through our grief, the connection and purpose we’ve felt has been profoundly healing. This unity is exemplified in marches led by Jewish Pittsburghers and our allies rejecting Trump, in a fundraiser by Muslim siblings who raised the money for all eleven funerals, and in the pronouncements across the country from rabbis who are thinking about how to protect their communities without investing in police militarization. Our community has made it clear that we will fight the root cause of this tragedy: white supremacy and antisemitism. On the other side, we’ve seen the right wing—both here in the US and in Israel—attempt to distort and use this tragedy. Trump used the moment to blame the victims and call for more, and more militarized, police. Political candidates—the very same ones stoking white nationalism—used the pre-election timing to unleash callous attacks on progressives for their support of Palestinians. Israeli leaders like Netanyahu and Naftali Bennett praised Trump and blamed the tragedy on Palestinians. Congress tried to push through a bill criminalizing the Boycott, Divestment, and Sanctions movement. The shadowy group Canary Mission tried to use our tragedy as a reason to shut down the largest student gathering in the movement for Palestinian rights. We are too unified and strong in our battle against racist nationalism to be fooled by attempts to divide and distract us. We won’t let them turn our tragedy into calls for more police, more attacks on Palestinian rights, and more collaboration between US police and Israeli military. It’s at this crossroads that we see the New England Counter Terrorism Seminar as precisely the wrong use of resources. We came together as a coalition a year ago to end these exchange programs. In the wake of our tragedy here, it’s clearer than ever that Trump and Netanyahu don’t care about our communities. And they certainly don’t make us safer. Law enforcement exchanges between US police and the Israeli army are harmful. Such programs support the further militarization of US law enforcement and promote the Israeli Occupation as a positive model for policing. Under the banner of “counter-terrorism” training, Israel is presenting lessons learned from 50 years of illegal military occupation over a Palestinian population deprived of human and civil rights. The tools of occupation—racial profiling, violent suppression of protest, massive surveillance, a divisive “us vs. them” ideology—are the last thing law enforcement should be studying. As a group of multi-faith, multiracial Pittsburghers, we have been brought together by our desire to end these harmful programs. And what we’ve found is the opportunity to build deep, real solidarity with each other. We are intergenerational and multiracial. We are Jews and Christians and Muslims. We are veterans and students. 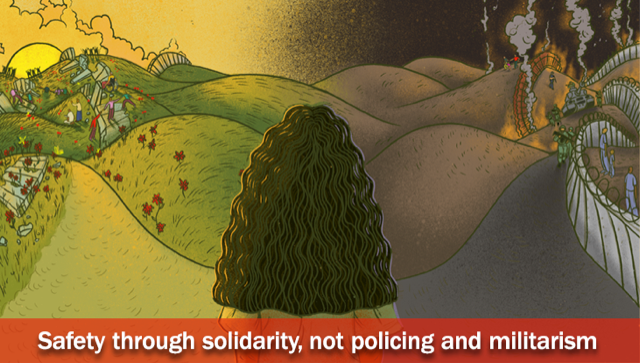 We started working together at this particular nexus of harm—racist policing in the US and racist occupation in Israel/Palestine—and by tracing the connections between these systems of oppression, we’re figuring out how to build real safety. We’re fighting police presence in schools, we’re defending and protecting immigrants from detention and deportation, we’re speaking out against US militarism at home and abroad, we’re fighting Islamophobia, antisemitism and white supremacy through education and public awareness campaigns. By trying to end one source of toxic connection between the US government and the Israeli government, we are making room for the kinds of connections that we need in order to build real safety for all people: connections between peoples’ movements for justice, equality, and dignity. When our Jewish community faced our worst nightmare just a few weeks ago, our commitments to each other and to our shared work were only reinforced. We are turning away from a world where every door is guarded and guns abound, where we are surrounded by checkpoints and watchtowers. We are turning toward a world of hope, where our safety is grounded in our community and where, instead of militarized policing, we invest in solidarity. Building a world of hope is a collective effort. One powerful step can be made today: We call upon mayors and governors throughout New England to refuse these lessons in oppression and militarization, to skip the trip and commit to never participating in the future.